Presented by Chris Smith, Sarah Castor-Perry. We look at the science behind, and applications of, the worlds smalleSeriously small structures are the focus of this week's Naked Scientists, as we look at nanostructures and their role in future energy technologies. We'll find out how nanostructures could enable us to safely store and quickly access hydrogen fuel, and to get the best from our batteries. Also, catching swine flu in the act of mutating, why females are more likely to suffer the effects of stress and weaving bomb proof curtains that expand when they're stretched. Plus, in kitchen science, we find out why soap bubbles create such beautiful colours. A new type of blast-proof curtain that gets thicker, not thinner, when stretched is being developed to provide better protection from the effects of bomb explosions. The Engineering and Physical Sciences Research Council (EPSRC) project is being led by the University of Exeter in collaboration with their spin-out company Auxetix Ltd and three other partners. The new curtain is designed to remain intact and capture debris such as flying glass when windows are blown in. Debris of this kind can cause severe, sometimes life-threatening injuries to people working or living in buildings within a blast zone. The curtain is primarily designed to be fixed over the inside of windows in buildings that are potential terrorist targets, such as Government and high-profile commercial properties. Potential uses could also include protecting building occupants from the effects of severe weather events such as typhoons and hurricanes. Blast curtains currently in use essentially consist of thick net-curtain fabric and work in conjunction with an anti-shatter film applied to the window to prevent fragments of glass from tearing the material. The new curtain aims to remove the need for anti-shatter films by using stronger, more resilient fibres woven into a carefully controlled textile structure. The secret lies in the yarn the curtain is made from. A stretchy fibre provides the core of the yarn and a stiffer fibre is then wound around it. When the stiffer fibre is put under strain, it straightens. 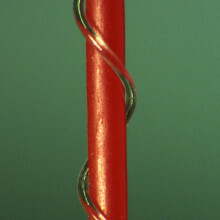 This causes the stretchy fibre to bulge out sideways, effectively increasing the yarn's diameter. Scientifically speaking, the yarn is an 'auxetic' material - one that gets thicker when stretched. The research team has identified a whole range of widely available, tough fibres that can be used in the yarn. Producing the yarn and turning it into a textile are also completely conventional processes. The extent of the auxetic effect is determined by the precise angle at which the second fibre is wound around the first fibre, and also by the two fibres' relative stiffness and diameters. Altering these parameters enables the yarn's performance to be fine-tuned for specific applications (e.g. to withstand different levels of blast). The project team have focused considerable effort in this area. Another key feature of the new curtain is that, when stretched, small pores open up in it. Although too tiny for flying debris to penetrate, these pores are designed to let through some of an explosion's shock wave. This reduces the force the curtain is subjected to and so helps ensure it doesn't rip. At just 1-2mm thick, the new type of curtain can also be designed to let in a reasonable amount of natural light. It is currently being tested in situations similar to car bomb explosions. "In the 1995 Oklahoma City bombing, glass accounted for nearly two thirds of all eye and head injuries," says Professor Ken Evans, who is leading the project. "The blast curtain we're working on, which will be capable of dispersing the shock from an explosion extremely effectively, will be backed up by robust scientific understanding vital to ensuring it really can block flying debris and achieve widespread use." Testing at a Government-approved facility has already commenced. Following rigorous certification procedures, the new curtain could be on the market within three to five years. - The manufacture of smart, self healing auxetic bandages. Wounds that swell would put the bandage under tension opening up pores that are impregnated with an antibiotic which would then be released. - Dental floss that expands when you pull it, to fill in gaps to make cleaning more effective for teeth. - Civil engineering for the reinforcement of soils and for storm and flood mitigation. Scientists monitoring pigs in Hong Kong have spotted human H1N1 swine flu rearranging its genes. Writing in Science this week, Hong Kong University researcher Dhanasekaran Vijaykrishna and his colleagues describe how, by monitoring samples from pigs sent for slaughter, in January 2010 they picked up a new strain of swine flu with unknown pandemic potential. Owing to the perceived threat that pigs pose by acting as molecular mixing vessels permitting swine, bird and human flu strains to swap genetic material, the team have been monitoring the Hong Kong abbatoir for over ten years. 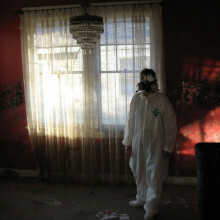 Between January 2009 and February 2010 they picked up 32 cases of flu amongst pigs, including classical swine flu strains and (since October 2009) cases of the H1N1 swine flu that caused the human pandemic. But the virus detected in January was different. It contained the core molecular workings of a circulating strain of swine flu but also had acquired the haemagglutinin (H) surface coat of the human H1N1 pandemic strain. This shows that the human pandemic strain, when it enters pigs, can clearly "reassort" with other pig flu viruses, potentially generating novel pandemic strains that might have enhanced virulence amongst humans. 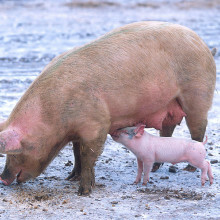 Tests carried out by the researchers showed that the new strain could transmit readily between the pigs, indicating that it was fully infectious, although it tended to produce a mild illness. Nevertheless, this observation should serve as a warning, say the researchers, that more widespread surveillance of pigs is crucial in order to help us to predict and mitigate potential future threats to public health. This week, a team of scientists have shown that one of the deadliest strains of malaria travelled with early humans as they left Africa and colonised Asia.The current understanding is that modern humans evolved in the Afar region of Ethiopia. About 55 thousand years ago, they began to migrate out of Africa to colonise what is now Europe and Asia. The paper, published in Current Biology, describes that there is a decline in the genetic diversity of the populations of Plasmodium falciparum as you move further away from sub-Saharan Africa. The team collected blood from individuals infected with falciparum from countries in Africa to South East Asia and South America. Because Plasmodium falciparum only infects humans, it can only have been transported out of Africa via humans. The team compared the genetic diversity of the parasite with the timing of migrations out of Africa. It's already well documented that the genetic diversity of human populations decreases as you move further away from sub-Saharan Africa, because people have simply been there for less time and there has been less time for new mutations to arise. The team found that the genetic diversity of the parasite decreased with distance in exactly the same way, and the age estimates fitted with the parasite accompanying the migrating early humans, with the exception of South America, where the results pointed to a much more recent invasion of the parasite - probably to do with the slave trade. 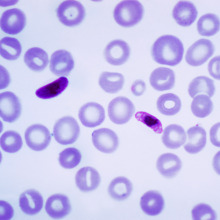 The genetic diversity of the malaria parasite plays a key role in how dangerous it is, so knowing more about the diversity can help us to find better ways to fight it, which given that falciparum is the most dangerous strain of malaria, is a very good thing. Scientists have found a way to use gene therapy to combat HIV infection. Although drug therapy has revolutionised the treatment of HIV, it is not curative and inevitably patients still eventually succumb to drug-resistant forms of the virus, treatment-related side effects or cancers such as lymphomas, which occur much more commonly amongst HIV-infected individuals. Part of the reason why HIV is so hard to treat is that the virus lurks inside the human genome, inserting covert copies of its genetic material into the host DNA where it sits out of reach of the effects of drugs or the immune system. Consequently, in recent years, scientists have been attempting to develop "genetic medicines" that can target this hidden form of the virus. Previous attempts to carry out "gene therapies" in humans, for a range of different diseases, have produced mixed results and are often hard to justify on ethical grounds. But now a team based in California have provided encouraging evidence that such a strategy might work. Writing in the journal Science Translation Medicine, City of Hope scientist David DiGiusto and his colleagues explain how they have safely and stably genetically modified the immune cells of seven HIV patients to make them resistant to HIV. The team first collected non-HIV infected blood stem cells from the patients, who were undergoing treatment for lymphoma, a blood cell cancer that occurs more than 100 times more commonly in patients with HIV. Working in the culture dish, the researchers then used a disabled virus to add to the cells several genes that interfere with the growth of HIV. The cells were then maintained in culture for a further period of time to check that they were safe before they were reinfused back into the patients where they took up residence in the bone marrow and began to produce new blood cells. Checks on the patients' blood confirmed the presence of cells carrying the anti-HIV genes two years later, when the study ended. This shows that techniques like this can be used safely to protect immune cells from HIV infection. 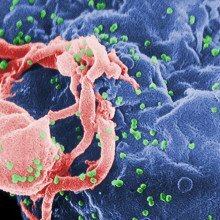 Next, a much larger study, in which higher counts of modified cells are administered, will be needed to determine whether this technique can aid the elimination of HIV from the body. Researchers in Philadelphia have found that there is a difference at the molecular level between how male and female brains deal with a particular stress hormone, which could explain why women are more prone to stress or anxiety related illnesses like post traumatic stress disorder and depression. The study, published in the journal Molecular Psychiatry by Debra Bangasser and her colleagues, compared the brains of male and female rats in stressed and unstressed situations. They measured the activity in the brain cells using electrodes and also took samples of brain tissue to look for specific proteins. The stress hormone they were looking at is called Corticotropic-releasing factor or CRF, and it's produced in a region of the brain called the hypothalamus, and it plays a key role in stress, along with hormones from an area in the brainstem called the locus ceruleus. 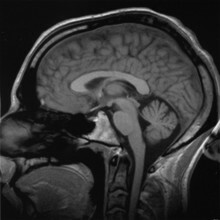 Activation of the locus ceruleus and the hypothalamus by a stressful stimulus or situation leads to the production of other hormones, like adrenaline, that can lead to many of the symptoms of stress disorders - like sleeplessness or inability to concentrate. The team found that the female rats were much more sensitive to the CRF than the male rats, meaning that they would be more likely to react to a stressful situation than a male rat would be. But they were also less able to deal with high levels of CRF - the males could lock it away in little sacs in the brain cells called vesicle, and this allowed them to adapt to the higher levels, but the females couldn't adapt and would continuously show the stressed response. So what does this mean in the wider context? Well, this is only a study in rats - it may not translate directly to humans, but it does offer a pretty good model. What's interesting is that because we now know that the CRF receptors in male and female brains differ, and we know HOW they respond to CRF, this could open up new avenues of research for drugs to treat things like depression and post-traumatic stress disorder. And it may mean that we need to look at treating males and females with these illnesses in different ways. Chris - Also in the news this week, a new type of material, one that gets thicker rather than thinner when you stretch it, this is called an 'auxetic' material is being developed by EPSRC fund of researchers and they're trying to provide better protection from the effects of bomb explosions. Jane Reck spoke to the inventors who are based at Exeter University. Jane - In this research laboratory, cutting-edge science and technology is getting a helping hand from an old fashion machine, a traditional craft loom. But instead of weaving cotton for clothing, it's making a completely new type of fabric. It's a material that will give much better protection from the effects of bomb explosions and severe weather events such as typhoons and hurricanes. The project uses auxetic materials and is led by Professor Ken Evans at the University of Exeter. Ken - An auxetic material is unusual in that it's a material which when you pull it, does something that you would not normally expect. If you imagine pulling a rubber band, two things obviously happen when you pull it. It gets longer and at the same time it gets thinner, and this is a very easy thing to see with a piece of rubber, but that's the fact with the case of any material. If you could pull a piece of steel, you would find it was getting thinner as it was getting longer. Well auxetic materials do exactly the opposite. When you pull them they get longer but at the same time they get fatter. This particular project is about blast mitigation. It's about using auxetic materials to make a textile which we can then produce a curtain material from which will act to mitigate blasts in an explosion situation. And auxetic materials we believe have particular characteristics that will mean that they absorb energy much more effectively than the current conventional materials. Jane - The hands on work of identifying which materials need to be used, the manufacturing and testing of the yarns, and analysing the results of those tests is carried out by Dr. Mike Sloan. Mike - The really useful thing about this research is that we're taking conventional fibres. So these are fibrous materials you can buy off the shelf, so you're talking about stretchy materials, elastomeric materials like polyurethane and then you're combining it with a higher performance fibre like Dyneema, people probably have heard of that. Also, ultra high stiffness carbon fibres and it's the method in which we combine and it gives you auxetic effects. So it's conventional materials in a helical arrangement that gives the auxetic effect and there's a number of parameters we can change. We're looking at the stiffness ratio between the two fibres and also the angle at which the second fibre is wrapped around the middle fibre. We designed and built a purposely designed spinner here at Exeter and we can load our core fibre onto a single-spool feed spool that's taken up at the end on a take-up spool. And we just program in the relative speeds of the actual spools and that will manufacture a yarn - very accurately controlling what we called the 'wrap angle' so how tightly the wrap fibres wrapped around the core fibre. Then that yarn will then go back to the mechanical testing machine and I'll add on some extra hardware that we've got and will characterise its mechanical performance, but also shape change, how auxetic is it. When it gets this much longer, how much wider does it get? Then those most promising yarns will go forward onto our loom. The loom that we actually use is designed and sold as a craft loom. There's nothing special that we've done to the bit of equipment. There's no modifications that we've made. The only thing we do is these are auxetic yarns to make an auxetic textile, and by using a computer controlled software on the loom, we can actually change the weave pattern as well so we can go from a straightforward, what we call a 'checkerboard weave' right up to complicated twill weaves. It's at another parameter that we can change using the loom as well. Jane - A crucial part of the design process involves the computer modelling work carried out by Julian Wright, a research fellow at the university. Julian - If we want to make enough yarn to make a curtain-sized piece of fabric for example, that will be several hours' worth of time. So that's a very expensive mistake if we don't get the yarn right at the design stage. That's a key facet of the computer modelling, is to be able get the yarn right without actually having to spend hours making it and then seeing it if it was right. We want to know it's going to be right when we've made it. The computer modelling at this stage is concentrated on the yarns. So we're not yet modelling the textiles and we're certainly not yet modelling the explosions. We're specifically interested in how will the yarn behave when we stretch it, how fat do we need to make it, how stiff do we need to make one or more of the components, what angle do we have to wrap the helical component at, how far can we pull it. One of the major parts of the modelling activity at the moment is to be able to predict the behaviour of the yarn from a knowledge of the two components. We know what polyurethane's like. We know what polyamide is like for example. What we would like to know is if we wrap those two together, how will they behave? The major achievement so far of the research certainly in the context of computer model is that we now have very detailed knowledge. We understand very well how to design a helical auxetic yarn. Jane - The tests that the team have used to put the material through its places show that the shockwave from a bomb blast travels more than 1500 miles per hour. Ken and Mike explain what the tests have shown. Ken - The very first thing you see is the light that comes from the blast, and then a pressure wave arrives from the explosion, and that moves the curtain inwards as you might expect it to do. And then following on from that, you then get destructive damage. So if you have a glass window, the glass shatters and breaks. Now what happens is the curtain is moved by the pressure wave first and because our fabric is auxetic, it opens out in a particular way. The curtain at that stage is not damaged by the blast at all. So the glass fragments then arrive after the pressure wave and are essentially captured by the curtain. And at this point, the curtain starts returning to its original shape. It stops ballooning out. It moves back in the other direction. And in fact, what we see is the glass fragments collected and essentially thrown back, almost like a trampoline effect, back out of the room. So you can see the energy absorbing mechanisms taking place while this process is going on, and what's been particularly useful is to be able to do the test with very high speed cameras to see exactly what the mechanisms are, so we can understand how the total process works. Mike - Not only have we watched the blasts under high speed video. We got pressure sensors before and after the curtains and the two things that are really interesting are the peak pressures that we measure, but also the time duration, and when you take the area around of that curve, you get what we call the 'impulse' and that's really the energy that's experienced as a function of the blast. And our preliminary data are showing that curtains give a 25% reduction in that impulse. So the 25% reduction of the energy that somebody the other side of the window would experience, so it's looking really promising, and you know, we can only go forwards from here. Jane - Ken hopes it won't be too long before we see the fabric in general use. Ken - I would say that within 5 years, you could see commercial fabric on the market, providing they meet the promise that we believe they're going to do. Chris - That was Ken Evans, Mike Sloan, and Julian Wright from the University of Exeter and they were talking to the EPSRC's Jane Reck. Chris - We're joined by Professor Stephen Bennington. He's from ISIS at the Rutherford Appleton Laboratory and his work looks at how nano structures could give us a safe and accessible way to store hydrogen. Steven, hello. Stephen - Hello. Nice to be here. Chris - Thank you for joining us on the Naked Scientists. Many people may wonder, because of all the hype about hydrogen, why is it such a wonderful fuel? Stephen - Well it contains an enormous amount of energy and also, when you burn it of course, it just goes back to water, H2O. So it's a very clean fuel. In fact, it's an ideal fuel if we can find some way of getting it into a car and using it. Chris - Although that assumes of course that you can make the hydrogen cleanly in the first place. Stephen - True. Exactly. It's only a store. It's not a fuel. You don't take it out of the ground or anything like that so you have to find some method for making the stuff. But of course, we know how to make clean electricity. We haven't done it properly yet, but you know, you can have wind power, you can have solar, and you can have all these wave machines, and you can have nuclear. And that you can use to make clean hydrogen which is then transferred to a different sector and burn it in your cars. Chris - Well the emphasis really is on the word 'burn' isn't it? Because as the Hindenburg showed us, there are one or two problems with using this wonder fuel as well. Stephen - Well, in principle, it's not actually as dangerous as petrol. They've done these tests and if you puncture your fuel tank in your car, the petrol flows underneath the car, sets alight, and then burns up through the car, and you're a toast. But hydrogen of course burns upwards and so generally, it burns away from you. So if you look at the Hindenburg, actually, most of the people survived. You wouldn't have that in a plane crash. In a plane crash, you'd be dead. So it's not as bad as people think. It may have a bad image and it is dangerous. Anything that can propel you along a motor way at 70 miles an hour, it's going to have a lot of energy in it, so you know, it's not going to be perfectly safe, but it's safer than petrol probably. Chris - So why are people worried about hydrogen and why don't we just make cars with a big hydrogen cylinder in the back, and people go to the garage and fill that with hydrogen. If it's safer than fuel, it shouldn't be a problem. Chris - You have a big tank, I presume. Stephen - It's a fairly big tank, but you know, that's not really the problem. It's 700 bars and you can have 700 bars of air in the back of your car, and that's not going to be safe. You're going to have insurance problems, you're going to have licensing problems. It's not going to be a thing that a consumer is easily going to want to buy. Chris - So there's a transportation and a safety issue. Chris - What are the solutions? Stephen - Well what we're looking at or a huge number of people around the world are looking at, is a way to store it within a solid material. And if you can store in a solid material at ambient pressures and temperature, you just heat it up slightly and hopefully at low-ish temperatures then the hydrogen is released and you can use it. And you can store concentrations in many materials that are more than in these high pressure tanks, but they're not ideal for many reasons. Chris - I get it. So you can make a material that enables you to store more hydrogen than you would get in a tank at those tremendous pressures, but at lower pressure. Chris - And therefore it's much safer. Chris - How on earth does that work? Stephen - Well, it sits in the interstices of the atoms. Well there are various different methods all right. 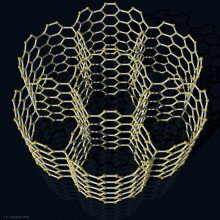 So, one method is you take a very high surface area material and you know, carbon nano tubes were mooted a few years ago, and the hydrogen then sticks on the outside of that. And the other method is when we take one where the material soaks it up like a sponge, and it sits in between the atoms of the material, so one of those two. Chris - And your approach? Stephen - Well we do both. You know, kind of hedging our bets that one of them is going to work. The problem is that the material, the high surface area material is you have to cool the material down, so it's cryogenic which is not perfect. You'd rather not have that in your car. And the other ones, all the ones where it goes into the interstices of a normal material, they run up to a higher temperature. And so, we're looking at ways - nano technology is one of them - of bringing them down so they operate ambient pressures and ambient temperatures. Chris - So, for want of a better expression, you want to build some kind of molecular cage which enables you to put the hydrogen into that cage which will soak it up safely at low pressure, and enable you to store large amounts. Is this deliverable? Can we do this? Stephen - Well yes, we think so. We've got prototypes of things that are kind of working. 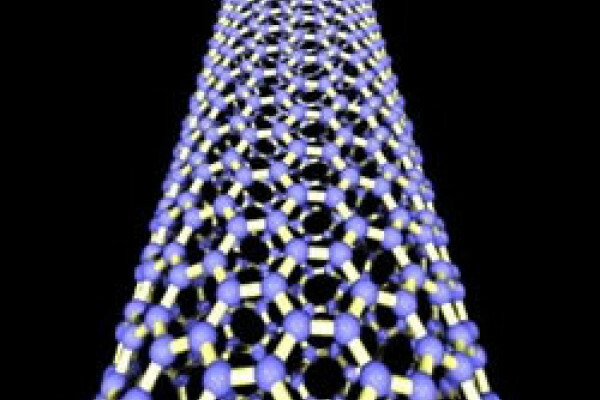 Nano technology is really the answer and that's what we are concentrating at the moment. So we're taking these materials that normally run, let's say, 200 or 300 degrees centigrade and we're making them very small so making them into a nano scale material. And if you do that - well I'm really sort of going of ourselves here, but one of the things, it reduces the temperature which it operates. But there's also another problem with many of these materials. In fact all of these materials run at these high temperatures. They take an extraordinarily long time for the hydrogen to come out, and you can't wait half an hour when you put your foot in the accelerator to get off. You got to have it now. And if you make the materials small, then of course, you reduce all the - what they called the 'rate limiting' steps for the hydrogen to get out. You know, so it's got a large surface area, so the hydrogen can get to the surface, recombine, and get away and diffuse away. When it's inside the material itself, it doesn't have very far to diffuse, but the key point here is that it transforms in a different way. The phase transformation from the hydride to the non-hydride phase is completely different. So in a normal bulk material, you have a big lump of it, the outer surface, like an onion skin around the outside might go to the hydride phase, and then it would massively expand, and you'd have this big phase boundary between hydride phase and the non-hydride phase. Chris - This is meaning where the atoms of hydrogen stuck on as the hydride form. Chris - Oh, I see - by shrinking it it's much easier because you're doing this on the small scale throughout rather than trying to get big blobs. Stephen - Kind of. I mean, there are two things. One is that if you have a big lump of material, that skin around the outside can stop the hydrogen getting into the centre, but also, on a nano scale material, it just switches right back, it clicks from one phase to the other and it doesn't have any phase boundary at all. It just switches and that's going to be very, very quick. It can go in seconds. And so that's why it reduces the temperature at which it operates and it can make the hydrogen come out really fast, and that's been proven. Chris - And just to finish off, can you tell us what is the material, the magic material that's doing this and how are you building it? Stephen - There are a large number of materials, but the technique we're using is called 'electro spinning." Actually not too different to what we heard in the previous article, but if you extrude a small amount of a hydride material surrounded by a polymer out of a needle and then put a large electric field on it, it pulls a very, very fine fibre, a nano structured fibre, and it makes a kind of tissue-like material, and that material works. I mean you know, you can use various different hydrides in the centre, and we're trying all sorts of different ones, and you get the reduction of the temperature and you also get this high speed hydrogen release. Chris - And just to finish, how long before we see this actually being commercially viable rather than something in a laboratory? Stephen - Well we're setting up a company now and hopefully in 5 year's time, we'll have a product. So, that's the plan. You know, things can slip up, but that's what we're aiming for. Chris - So this is soon. I mean, that's fantastic news, isn't it? To think that you're actually going now commercially for this. Stephen - That's right, but we're talking about prototypes in that time. So you know, in the same way that you can buy these prototype electric battery vehicles, lithium battery vehicles, in 5 year's time, hopefully, these will be available on trial. Chris - Terrific. Thank you. Stephen Bennington from the STFC's ISIS Neutron Source. Chris - Now we all know what happens to water when it freezes. It becomes ice, but it does some weird stuff as well because the ice is less dense than the water and it floats, and there are still lots of unknowns about how this sort of transition from water to ice actually happens, especially on the nano scale. So understanding this could help with a wide range of different industry applications, as well as our predictions of what will happen with climate change. So this week, Meera Senthilingam went along to the London Centre for Nanotechnology to meet Angelos Michaelides to find out how his team are looking at how water turns into ice. Angelos - There's really many, many interesting things about water. It's an everyday substance - we're made of water. It's all around us. Our Earth is covered in water, but we still don't understand many of the properties of water at the molecular scale, and one of the processes we're trying to understand is just how water freezes; how individual water molecules come together to form little ice particles. Meera - Well why does ice form in the first place? So why does water become ice? Angelos - When we're below zero degrees, ice is simply more stable than water. Most of the times when water freezes, it happens at the surface of some impurity particle, and so, it's the actual presence of these little impurity particles, maybe minerals or clays or dust particles that actually allow you to nucleate ice. The water will stick to the little particles, form a little ice particle, so this is a nucleation process, and then once you have a small ice particle, just like in crystal growth, it's very easy for more water molecules to stick to the little crystal and to grow, and to expand. So we really want to know how exactly, looking really at the level of individual molecules how this ice forms. Meera - More specifically, you look at this formation of ice on particular materials or solids such as metals rather than just how ice forms in the first place. Angelos - Yes, so water really is one of the most incredible substances that we have. It occurs in our environment in all three phases, solid, liquid, and gas, and in the solid phase, there are 15 different phases of ice alone. And so, you can imagine when you introduce some other material like a surface, then you get all of this beautiful array of complex and interesting behaviour. Meera - How do you set about looking at this? Angelos - One of the techniques that has really transformed our understanding of water at interfaces at the nanoscale, is the scanning tunnelling microscope, and this is an incredible technique that allows you to see individual molecules and atoms at surfaces. And then we will take this experimental insight that comes, and we will try and build models to really understand at the molecular scale how these structures form, what structures form, and why. Meera - And so, what have you manage to find out so far then? Angelos - Well one recent example that was interesting because it went sort of against common belief was where we were looking at water on a copper surface, and we noticed that water forms chains. And when we did our models to understand what is the structure of these chains, we noticed that the water is actually forming pentagonal arrangements. So it's actually forming chains built out of water pentagons. This is interesting because we know from daily life that snowflakes come as hexagons and have this hexagonal motif, and out of all of the 15 different ice phases, none of them are actually built out of pentagons. If we go to another surface for example, if we go to a palladium surface, we don't form pentagons, but we don't form traditional ice-like structures either. We form something that looks like really beautiful rosettes, and a lacy structure. 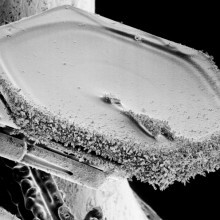 www.chem.ucl.ac.uk/ice: As the structure of the humble snowflake attests to ice crystals normally come in hexagons. However, our simulations (along with experiments from Andrew Hodgson and co-workers at the University of Liverpool) show that ice can come in pentagons too. The movie shows an ab initio molecular dynamics simulation of a chain of water pentagons on a Cu surface. To learn more see www.chem.ucl.ac.uk/ice or Carrasco et al, Nature Mater. 8, 427 (2009). Meera - So that's really quite fascinating that it just varies so much on different solids or different metals in this case. Now you've also been looking at the formation of ice on clay particles which is important for understanding our atmosphere. Angelos - Yes, so when we're starting the formation of clouds, this typically starts off with a super cooled water droplet. So a small micron-sized water droplet that is already below zero degrees, but it won't freeze at super cooled. This freezing process is helped by a foreign substance which in the atmosphere, quite often is a clay particle. Little nano-size clay particles typically float about in the atmosphere. They get there from dust storms in desserts. So we're interested in understanding these clay particles and how they make the rain, and make the snow because without these agents that would nucleate the ice, it simply wouldn't rain. Outside the tropics, we require ice nucleation to have rain. Meera - I mean, it's clearly interesting to understand this simply to know why it does rain as you've just mentioned, but what are the applications of potentially of knowing this about the formation of ice on so many levels or on so many materials? Angelos - In the atmosphere, we want to know how and why ice forms if we want to understand issues like global warming to understand the impact of ice and clouds, and water in the environment, and how it impacts upon - say for example, the temperature of the globe. Aside from this sort of environmental interest, there's all sorts of technologies who are interested in ice nucleation. One example would be the airline industry. Their planes, as they're flying through these super cooled water droplets at minus 30 degrees, it's incredibly useful that ice doesn't form on the wings, on the fuel lines, all over the planes. Like that plane for example that crash landed a couple of years ago at Heathrow. It did so because ice formed on one of the fuel lines which cut off one of the engines. So there's an industry who are very worried about ice nucleation. Ice cream manufactures are also interested in this. Ice cream doesn't taste very good if it's covered in little icy particles. And going back to the atmospheric connection, it's incredibly important for these people who want to control rainfall, who want to so-called 'seed clouds' to make it rain. 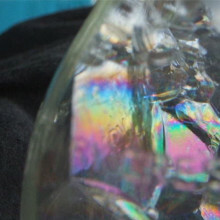 They're interested in knowing what is an efficient material at making ice so as to make rain, and one of the most widely used materials is silver iodide because it has a structure which resembles very closely the structure of ice. Meera - So that's quite a wide range of applications. So, what's the next step in this research then, in order to help this wide array of industries? Angelos - At the moment, we can identify what structures form and we can understand why, but we're not at the stage that we can predict. So we would ideally like to be able to predict and to say, "Okay, you give me a material and I'll tell you in advance how it will behave", to try and identify the basic principles and the basic trends that control ice nucleation at interfaces. Chris - Who would've thought the most common molecule on the earth within - well, a few words of magnitude, could be so complicated. That was Angelos Michaelides. He's from London Centre for Nanotechnology which is a collaborative institute between UCL, University College London and Imperial College London. He was talking to Meera Senthilingam. 35:31 - How much pressure did steam locomotives work under? How much pressure did steam locomotives work under? Chris - A listener, David in Fincham, has informed us that mainline trains ran at 17 atmospheres, the Flying Scotsman at 15 atmospheres and older models around 10 atmospheres. Also, Mr. Wikipedia tells us that high pressure steam locomotives operated between 23 and even up to 100 atmospheres, that's 1500 psi, but they did need special design to do that. 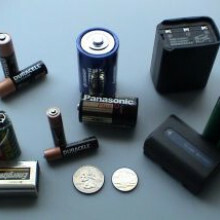 Clare: - A battery comprises three main components. You have an anode and a cathode, otherwise known as a positive or a negative electrode, and they're separated by an electrolyte which in most lithium ion batteries is an organic solvent with a lithium salt that allows the lithium to shuttle backwards and forwards. Now if I want to charge a battery very quickly, that means I have to get the lithium and the electrons in and out of my particles in the electrodes, and so your commercial standard battery material in the cathode is lithium cobalt oxide, and that's a material that's many microns in size. And so, when I charge the battery, I've got to pull the lithium out of this micron-size material and that takes a long time. And that's why it takes you a long time to charge your battery for your cell phone or your laptop. But if I could make the particles smaller, then I would be able to do this much more quickly and get a much higher rate material. Sarah: - Nano structures would seem to be the ideal candidates of this task as their small size and large surface area would allow for quicker reactions, leading to quicker charging times. But it's not all plain sailing. Clare: - There are some very good things about nano, but there are also some disadvantages, and one of the major disadvantages is the surface areas. And so, if you have high surface area, you have a higher potential for side reactions with the electrolyte, and most nano materials and battery materials are not actually stable in the organic electrolyte you use in your batteries. Now what happens is, as you're cycling material, they form a passivating layer, a coating of inorganics and organics on the surfaces of the materials that protect the material from further attack by the electrolyte. But now if you imagine it's nano-size, you have a massive surface area. And so, that whole decomposition to form this passivating layer eats up lithium, and you have a finite amount of lithium in your cell. So the more you eat up, the less you have to use in your battery application. Another disadvantage with nano particles, because you can have so many side reactions, is if you have too many side reactions, the system can heat up. Once the system starts heating up, many meta-stable materials can release oxygen. It's the oxygen that then reacts with the organic electrolyte and at high temperatures, that electrolyte can catch fire, and it's that electrolyte burning that you see in many photos on the web of batteries exploding. And so, if you examine the pros and cons of nano, it's clear that nano materials and nano structured materials allow you to get your lithium and electrons in very rapidly, and so, that's going to be a massive advantage when you want high rate systems. But it's going to be a disadvantage if you're looking at safety. I think there are some solutions that will allow us to use nano structures, but it's a very, very important design criteria that we need to build safety into our design. Sarah: - And Professor Grey's work is helping to examine exactly what those solutions to the problems with the use of nano structures in batteries might be. Clare: - We're very interested in working out the fundamentals by which battery materials function. So how do the lithiums come in and out of the materials. We do that because if we understand how they function, we can use that to design better materials, and we can also use that to understand why sometimes they don't work. So what we've done recently that we are very excited by is we've developed a setup, whereby, we can make little batteries that are about the same size as hearing aid batteries. And we connect them up to a potentiostat and that potentiostat is just like a battery charger you might have at home, except it's a little bit smaller, and a bit more accurate. And then we make use of the fact that lithium has nuclear spin that you can see in an NMR spectrometer. So that allows us to see where the lithiums are going as we charge the batteries. The exciting thing for us is that we can see functioning in real time, all the different components, and we can work out what each component is doing and how each component is influenced by things like charging fast. So when you're wanting to charge your battery for transportation applications, or if you're using a hybrid electric vehicle and you put your foot on the brake, that requires an extremely rapid charge, and that puts tremendous demands on your batteries, and that often in itself encourages the formation of side products that then may have negative consequences on how the battery then functions, and the bottom line is we can see this in real time, and we can try and device strategies to prevent that happening. So we're looking at function and structure, and then trying to use that to then design newer systems or improve systems that both last longer, and more safe. Sarah: - And if you've ever seen a battery self-ignite, I'm sure you'll agree that safety is paramount. That was Clare Grey from the Department of Chemistry at Cambridge University. 48:32 - How might spintronics help nanotech? 49:28 - Will hydrogen powered cars upset the balance of oxygen in the atmosphere? Will hydrogen powered cars upset the balance of oxygen in the atmosphere? It shouldn't do because it's recycling it. So I mean you're taking water, you split it up into hydrogen and oxygen, and then you recombine them again in your car. So, the net effect is zero. Water vapour is different perhaps because if you're using these things to power jets up in the high atmosphere and then you're depositing water vapour up there, and that's a greenhouse gas. So we have to think carefully about those problems. It's probably not a problem, but it could be. 50:03 - Is there Hydrogen on the Moon? Is there Hydrogen on the Moon? Stephen: - Well I know there's water up there. NASA scientists have discovered this recently, but there's no hydrogen as far as we know. I've not seen any reports of it. Hydrogen will only stick on surfaces either below 20 Kelvin or in very thin layers up to perhaps about 50 Kelvin, and most of the moons are higher temperatures than that. There might be little dark areas whether it's cold in there, but on the whole, no. Chris: - But the fact they found water out there with the mission to slam the probe into the south pole of the moon, means that we can just get the hydrogen we need by extracting the water and electrolysing it presumably. Stephen: - Absolutely, yes. Chris: - So it shouldn't be a problem. 50:54 - How do we safely store hydrogen? How do we safely store hydrogen? We discussed this with Stephen Bennington, from ISIS at the Rutherford Appleton Laboratory... Chris: - Is this similar to the work you do Stephen? Stephen: - Well we do work on what they call 'intercalated graphites' which is graphites which contain metals in between their layers, and the reason for doing that is that the metals charge up the layers of the graphite, and that means that the hydrogen sticks to it more readily. So this theoretical work by these Greek people was very interesting because it also spaces the layers of the graphite at the perfect distance to stick hydrogen in the middle. It's only theoretical. Chris: - They give you a massive surface area. Stephen: - Big surface area, yes. 51:35 - Is it true that women have a variant of the pigment to see in the red spectrum? Is it true that women have a variant of the pigment to see in the red spectrum? Chris - The answer is, yes, they do. The gene which enables us to see red light, in other words, encodes the red detecting pigment in the retina is carried on the X-chromosome, and because women have two X-chromosomes that they inherit from their parents - one from the mother and one from the father, they therefore have two genes in their body that are capable of detecting red. But during development, one of the X-chromosomes is randomly inactivated. This is called 'X-chromosome inactivation' because you don't want two copies of the chromosome active because you only need one because men only have one copy. But that process of inactivation is random in the tissues which means that some cells will be using one X-chromosome whilst other cells could be using the other X-chromosome, and therefore, if you extend that to the retina, there'll be some cells in the retina that are seeing red, using the gene on one X-chromosome, and some cells seeing red using the gene on the other X-chromosome. And this means theoretically, there could be different genes running in different bits of the retina, and therefore, the perception of red could be slightly different in different positions on the retina in women. But because men have only one X-chromosome because our genotype is XY, we therefore don't inactivate an X-chromosome, and therefore use the same gene throughout the retina, and that's why you also find men who can be colour blind because they can inherit a red receptor that doesn't work. Whilst women, because they have two X-chromosomes, even if one of them has a defective copy, the other one is almost certainly still going to work and therefore, in general, you don't find women who have colour blindness. So the answer is yes. 53:23 - Can Dogs Watch Television? What does a dog see on a CRT style television screen? Do they insist on new LCD/LED or Plasma screens for their entertainment? David: - When we look at a picture on TV or the film in the cinema, it seems that we are seeing a complete flowing image. But actually, what we're looking at is lots of individual frames. They seem to flow together because our eyes don't notice the change from one image to the next. Old fashioned TVs and films produce images at about 24 frames every second and that's fine for people because we have what we called a 'flicker fusion frequency' how quick the image needs to change of about 16 to 20 times a second. But when we looked at dogs, we looked at them behaviourally. It's shown that their flicker fusion frequency is a lot higher than ours, maybe 40 to 80 frames a second. That means that when a dog's looking at an old fashioned TV or a movie, it would see it to be flickering a lot. If you look at modern plasma screens and digital TVs, they renew their images a lot faster, maybe up to a thousand times a second. So, theoretically, our pets should be able to see things a lot better on more modern TVs, but that's just a theory. Science needs the evidence, doesn't it? What's the evidence? If you type in dog watching TV onto YouTube online, you'll find nearly 4,000 results and most of them will convince you that actually, most dogs certainly react to animals easily on a TV screen, sometimes quite dramatically. But of course there, the trouble is we don't know what sort of TV is being used, do we? And how much do other confounding variables will say - things like sound that the animal might be reacting to rather than just the pictures. So it's not much of a controlled experiment. But just watching the reaction of the dogs on those video clips on YouTube shows to my mind convincingly that dogs are reacting to what they see on TV even if we can't be quite sure what they're seeing. You know what? I'd like to say, if you've put a dog or a cat that loves watching TV and lives very near Cambridge, would you contact me - David Williams at Cambridge Vet School - so we can do a bit more research to look further into this in a bit more controlled way. Diana: - It seems likely that dogs can watch new, high refreshed rates televisions. I'm probable that old CRT TVs would simply have appeared too flickery for them to make out a moving image. 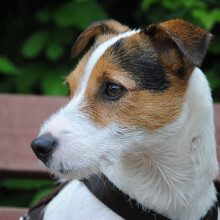 And on the forum, JP said that their dog would certainly react to seeing and hearing another on a CRT screen. So much so that she tries to run around the back of the TV to find the other dog.